Posted: Sat Dec 15, 2018 7:02 pm Post subject: 1958 D6 dozer engine? Brought this Caterpillar D6 dozer home today. Trying to identify it for sure. I was thinking that a 1958 D6 should have a D318 engine. I don't think this is a D318. Has oil clutch. Had pony motor but now is direct electric start. Thoughts? Posted: Sat Dec 15, 2018 7:12 pm Post subject: Re: 1958 D6 dozer engine? Should be on tag on pic . 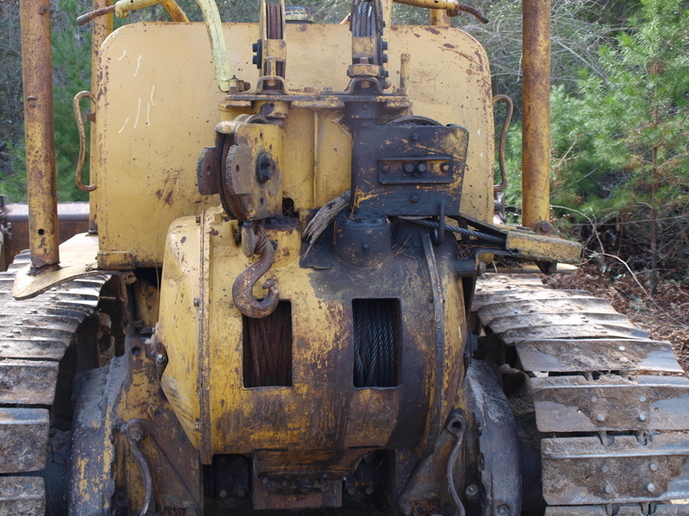 Posted: Sun Dec 16, 2018 12:54 am Post subject: Re: 1958 D6 dozer engine? if I remember right, 318 is embossed below the radiator surrounded by a block shape. About 3 inches by 3 inches. My Cat road grader had the same engine. Posted: Sun Dec 16, 2018 4:09 am Post subject: Re: 1958 D6 dozer engine? (quoted from post at 20:12:07 12/15/1 Should be on tag on pic . Wouldn't that be easy except that tag is hard to read. Kinda looks like: 44A243?? Can't tell for sure though. Anyone know where I can find a chart of engine numbers? So far, I haven't had much luck finding numbers that seem to match. I bought it as a 1958 D6 that should have the D318 enginge. All the pictures I see of a D6 with D318 engine, the engine is not the same as this one. Maybe this is not a 1958 tractor? I have not been able to find the tractor numbers. I read that they should be behind the winch. That will be tough to see without removing the winch. 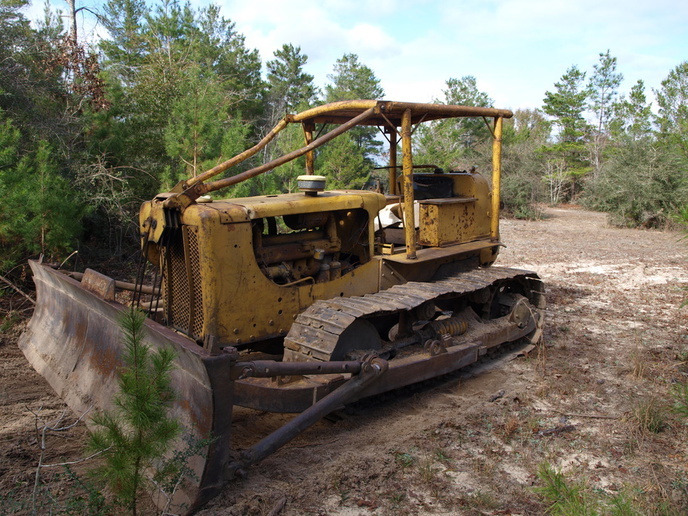 Posted: Sun Dec 16, 2018 5:59 am Post subject: Re: 1958 D6 dozer engine? Posted: Sun Dec 16, 2018 6:39 am Post subject: Re: 1958 D6 dozer engine? Posted: Sun Dec 16, 2018 7:02 am Post subject: Re: 1958 D6 dozer engine? You can add me to the ones that would like to buy it. I been looking for a cable D6 for a good long time. Nice looking machine. I am happy for you, and jealous all the same. LOL..
Posted: Sun Dec 16, 2018 7:45 am Post subject: Re: 1958 D6 dozer engine? You may already know if you are familiar with those machines,that second winch is not a drag winch.It is a tool winch,meant to pick up things like scraper pans.It is not meant to pull things out or up.It runs at a much different speed than a drag winch.If used for the wrong purpose they can self destruct pretty fast.The best part about them is the real expensive,wearing parts on the blade winch are in that side too.I had a D-6 9-U series with that same winch.Fortunately I was warned before I did something stupid with it.I was just about to do just that.Mine came from a fire department,who had gotten it through the Civil Defense.I think they are a nice nuts and bolts machine,and easy to work on. Posted: Sun Dec 16, 2018 7:48 am Post subject: Re: 1958 D6 dozer engine? Yes a D6B with the D333 engine,pity the grouser weren't built up before the shoes bent,what are the chains like,good dozer those,my choice would be a hydraulic blade with a tilt. Posted: Mon Dec 17, 2018 3:02 pm Post subject: Re: 1958 D6 dozer engine? Got the left winch cable loose today. Took a while as the ferrule on the cable had been pulled in so tight, it was stuck hard. Finally hooked my little Ford 651 to it and gently bumped it about a dozen times. Finally, out it came. I pulled the cable all the way out and then used the winch to pull the 651 back.Did that about three times and everything works like new! Started cleaning all the crud off and making a list of loose, missing and broken bolts. There are a few. Started checking fluids, grease and such. Also, sold a goat for $50. It was a good day. 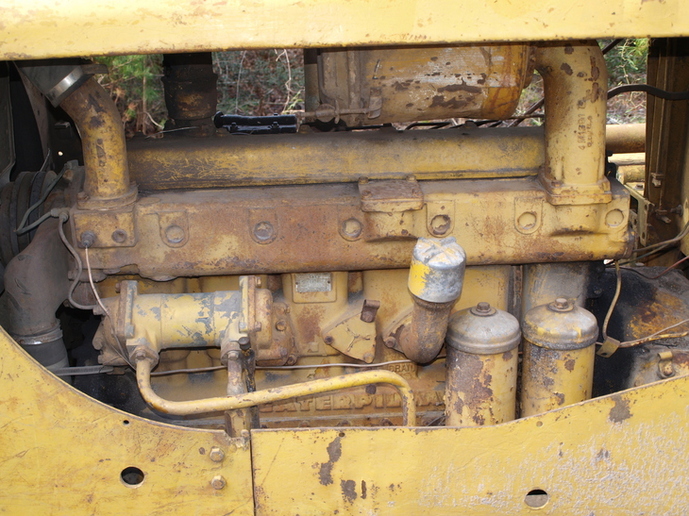 Posted: Tue Dec 18, 2018 11:23 pm Post subject: Re: 1958 D6 dozer engine? Drove one like that for a few months in the late 1950s, when I was much younger (and maybe not as cautious) clearing land. 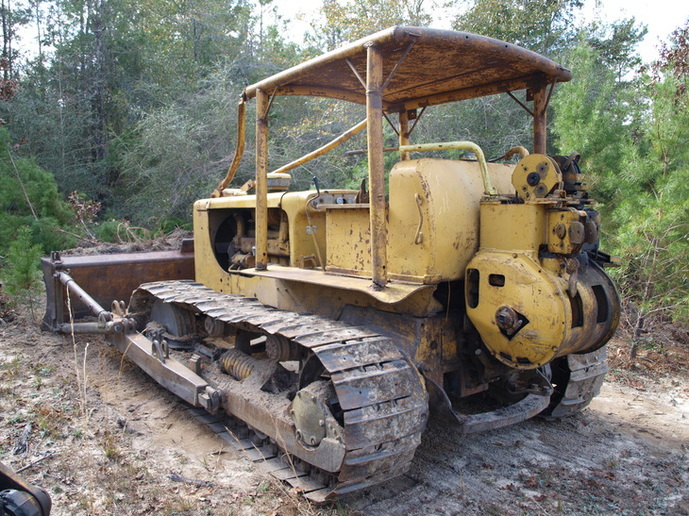 these machines at the time, especially when the dozer was used for land clearing as sticks tended to wipe out hydraulic hoses. 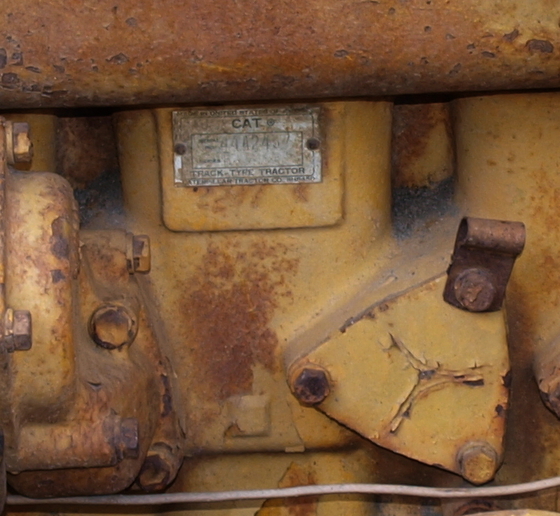 Posted: Wed Dec 19, 2018 4:25 am Post subject: Re: 1958 D6 dozer engine? (quoted from post at 08:45:21 12/16/1 You may already know if you are familiar with those machines,that second winch is not a drag winch.It is a tool winch,meant to pick up things like scraper pans.It is not meant to pull things out or up.It runs at a much different speed than a drag winch.If used for the wrong purpose they can self destruct pretty fast.The best part about them is the real expensive,wearing parts on the blade winch are in that side too.I had a D-6 9-U series with that same winch.Fortunately I was warned before I did something stupid with it.I was just about to do just that.Mine came from a fire department,who had gotten it through the Civil Defense.I think they are a nice nuts and bolts machine,and easy to work on. Now that I know the left side works, it will just be unused. I'll consider it "parts on the shelf" in case the blade side goes down. Got to keep the blade working. Posted: Fri Dec 21, 2018 3:10 am Post subject: Re: 1958 D6 dozer engine? Tag you have there is the engine serial number. The tractor tag should be down on the rear left side top of rearend case. That is where Ours are at . D-4 with 4G8 and No.6 traxcavator 10A1 The Traxcavator is a D-6 with a loader on it all hydraulic. Those grousers can be built up with some 1/2inch flat stock about an inch wide welded to the top of what is left of the original grousers. Don't be afraid to put the heat to it welding them on. Posted: Thu Dec 27, 2018 2:11 pm Post subject: Re: 1958 D6 dozer engine? Buddy, have a d6 9u in west Tennessee I'd part with.